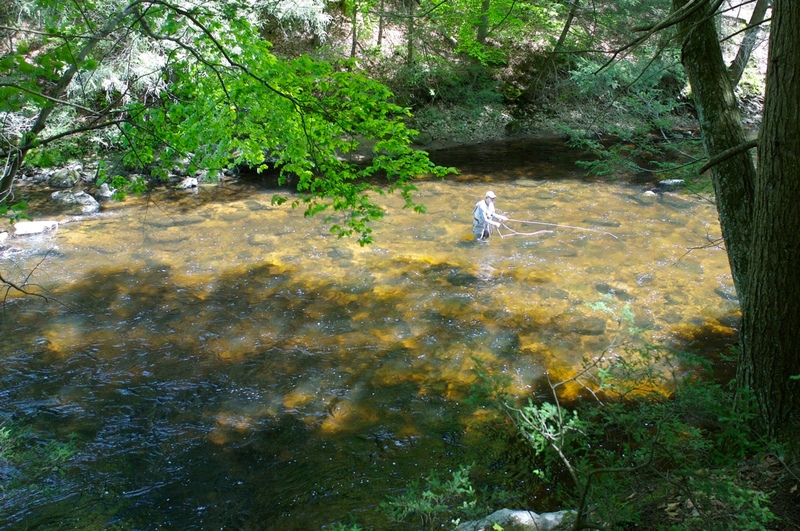 My name is Steve Culton, and I’ve been fishing Connecticut’s Farmington and Salmon Rivers for over 40 years. My areas of specialization include wet fly fishing, dry fly fishing, streamer fishing (fresh and salt), and indicator nymph fishing. Small streams are also a passion, as they give us an opportunity to catch wild trout in a natural, more intimate setting. And let’s not forget those cantankerous Housatonic River smallmouth bass. My approach to fly fishing for striped bass is quite different from most other anglers’: I use a floating line, traditional trout and salmon presentation methods, and sparse, impressionistic flies like flatwings and soft hackles. I am what you’d call a teaching guide. (I have had many clients ask me if I am a teacher for my regular job. The answer is no, but I am flattered by the question.) We all like to catch fish, but if your main goal is sheer numbers you’ll probably be happier with another guide. If you’re interested in learning new methods, fishing new flies, expanding your general knowledge base, or exploring a river, small stream, or salt pond, I might be the right guide for you. Of course, I will do my best to put you onto fish. I think you learn more when you’re catching. My fly fishing philosophy is pretty straightforward. There are no experts. 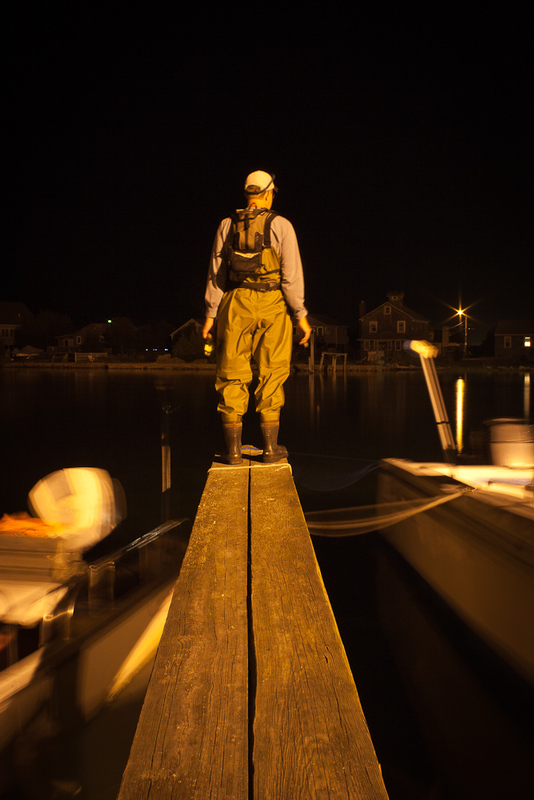 We all put our waders on one leg at a time, and we all still have something to learn. I’m just a guy who loves to fly fish. I’ve done a lot of it, read a lot about it, written a lot about it, and I’m very enthusiastic about sharing what I’ve learned with others. There are many, many ways to catch fish on a fly rod. In my experience, people fish best when they use methods and flies they have confidence in. Since I am a self-taught fly fisherman, I know the struggles of learning the game. When you’re fishing with me, there are no such things as dumb questions – or for that matter, too many questions. Above all, we’re out to have fun. James Leisenring wrote, “We fish for pleasure; I for mine, you for yours.” It is important to me that you enjoy yourself during our time on the water. Before any outing, I like to talk to my clients so I have a clear understanding of what their goals and expectations are. So – let’s go fishing. You can reach me at 860-918-0228 or at swculton (at) yahoo.com. Due to other commitments, my weekends are almost always booked. The good news is that weekdays usually mean far fewer anglers. 2019 Rate Schedule (Does not include gratuity.) 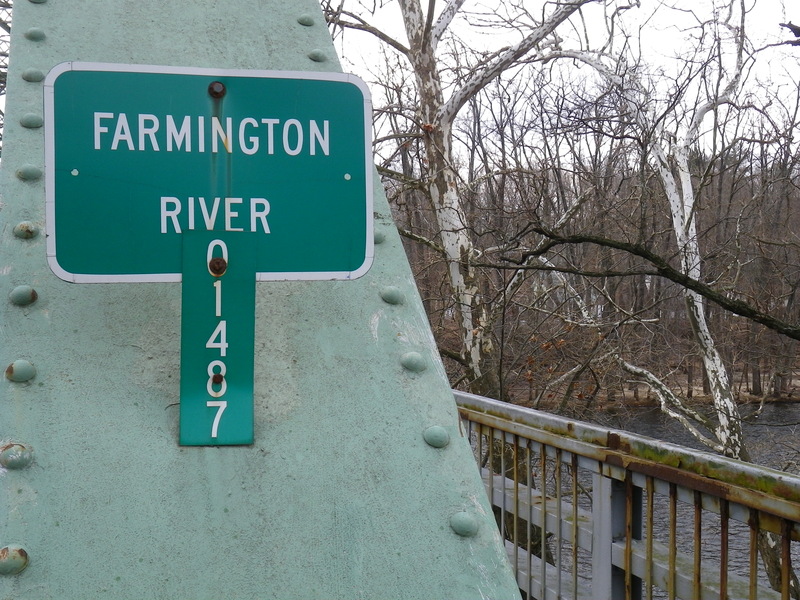 Rates may vary for non-Farmington River outings. Clients are responsible for their own gear (rods, leaders, waders, boots, etc. ), food, and drink. For client testimonials, click on the comments button below. This entry was posted in The Fisherman LLC Guide Service and tagged Connecticut, Farmington River, floating line, Salmon River, Steve Culton, striped bass, The Fisherman LLC, Trout, Wet fly, wild trout. I took Steve’s wet fly class last summer and spent some time on the water with him- great experience and I learned a lot. His teaching style is just what I needed. Steve, hope to fish with you again some time! Steve is an excellent guide, tutor and zen master when it comes to the more spiritual aspects of fly fishing. A true enthusiast, his passion is infectious, and the purity of his love for fly fishing hard to resist. For those who are bitten by the fly fishing bug and are curious to learn and explore with a real expert, then I couldn’t recommend Steve highly enough. You will also learn from a lifetimes volume of experience and have fun in the process.! A rare cocktail that I (speaking from my own experience) unreservedly recommend. I had a great day with Steve on the Farmington this past weekend. My goal was to learn a more classical approach to fly fishing, and find new places along the river that I wouldn’t normally go to… I accomplished both and much more. Steve is definitely a teacher type and a historian of fly fishing, which makes for interesting conversation on the river. Wet fly fishing is definitely a fun way to catch fish – kind of like a cross between dry fly and streamer fishing (pretty much the best of both worlds). As for catching fish, I stopped counting – I tend to do that when the fishing is good. Hell, I even caught two fish at the same time… Great times, I would definitely recommend Steve. Spent a terrific half day with Steve today on the Farmington. Conditions were truly exceptional. Bugs everywhere (caddis, mayflies, stones & midges! ), but nary a rise to be seen. Using Steve’s Wet Fly 101 approach we had more success than any of the other anglers in sight. Steve is a patient and thoughtful teacher. I have only been fly fishing for the past 28 years, yet Steve was able to teach this old dog some wonderful new tricks. His wet fly approach to water where nothing is obvious is terrific. We hope to do this again soon! My son and I spent yesterday on the Farmington with Steve. What a great day and an even better job by Steve.Our goal was to learn some tactics for wet fly fishing and Steve came thru in a big way. He not only got us into fish but taught us a ton about wet fly fishing . Both my son and I now feel confident with wet flies and believe we now have another arrow in our quiver.if any one is looking for a guide on the Farmington Steve comes highly recommended. He has great passion for both fishing and teaching and was a pleasure to spend the day with. Many Thanks Steve , Joel and I had a great day. My son and I had a wonderful day with Steve last week. We fished a number of places which Steve knew from his experience of fishing the Farmington year-round. He has just the right sense of his clients – when to show, when to teach, when to say nothing, really a perfect meld of guide and client. We had a great time and enjoyed being with Steve. As it was our first time on that river, we would have been guessing where to go without his know-how. I had a wonderful time on the water with Steve this week. I’ve been itching to get back into trout fishing for the last few years but have only managed to squeeze in a couple of trips between saltwater outings. These trips were not very fruitful. Worse than not catching fish, I had no confidence that what I was doing was right. So I decided to go with a guide. After reading some of Steve’s writings, I thought he sounded like the kind of guide I’d really like to fish with – a teacher instead of just someone that can find fish (although he does that well also). My thought was right on. Steve is an excellent teacher and a really good guy to fish with. Steve’s patience and positive attitude were really remarkable. We quickly broke the ice (it was cold but not that cold) with a beautiful rainbow on a nymph, a tactic I have wanted to learn more about. Steve made it clear throughout the day that he was all about helping me learn, which is exactly what he did. Steve loves to fish and loves to share what he knows..
After fishing with Steve I can’t wait to get back on the water and practice what I learned. I have much more confidence knowing that I’m going in the right direction. I look forward to fishing with him again . If you fish with Steve, make sure you ask him about his fish summoning gift. It is truly amazing….. Okay, so at least until April 19th I was lousy at nymphing and frustrated with the Farmington River where, in season, you’re piled up fisherman on top of fisherman, surrounded by contemptuous fish feed on something other than what I had at the end of my line and blurred my already faltering vision changing as many flies as I had which is to say very many indeed. Then, as a gift to myself for my birthday, I booked a day with Steve Culton. OMG, as my kids will text, what a teacher. While the wind was fierce and there were few signs of fish, Steve with patience, clarity and kindness, taught me about nymphing. Okay, his first demo netted him one but, really, it was all me after that. I got technique down to the point of production, found a few spots i never would have gone to, and then shifted to wet flies. That was a first for me. My confidence and ability have soared. I thought I knew the Farmington and flyfishing (I’ve fished all over the country and NZ and with many guides over the years). I was wrong. I don’t often say this, but Steve is a Master Teacher. I don’t say it all that often, because I am a teacher and I know how few masters of instruction there are out in the world. But Steve is one of them. I really wanted to learn, as Steve puts it, the Dark Arts of Wet Flies. I have done the dry fly thing a bit and the nymphing a bit too (granted two years in, I am still a newbie) and had takes and fish on both. But there is something about wading into rough and deep currents, watching the fly move in this way, and then getting a take at the end of a swing that is really magical. Steve was patient and kind and teaching me the ways of these traditional flies. And man does it work! I think we had about a dozen hook ups those five hours. There are guides who will teach, there are guides that will get you deep into the fish and now, thankfully I know one who can do both. Steve is, despite what he may say, the absolute professional and he is so in an absolutely unassuming way. He makes it look easy, and he then shows you how easy it can be. I learned more in the half day with Steve about being a good fly fisherman in technique and in attitude then I have learned over the past few years. Not to mention this guy knows the Farmington! Let’s just leave it at this, Steve is a master teacher. Ok, he is a master teacher, and master of untying tangles — I wish I could say it was the wind alone…He is simply stated the master of technique. If you want to up your style of fishing, head out with Steve. Lets just say since I had my time with him, I have been on fish at each spot I’ve gone to without fail. Thank you Steve for inducting me into the dark arts of traditional wet flies! I’ve been reading books, watching videos and listening to lectures but I learned a lot more in one day fishing with Steve. There’s nothing like spending a day on the river with someone who knows what he’s doing. Thanks again Steve, I had a great day. I just arrive for my fishing trip to USA, I had excellent time of fishing , I had two proposals in this trip, one fishing… the other meet this excellent guide. How much he teach us in two hours in the sea, I can´t imagine how much he can teach in the river…. I really would like to come back and…. lets try… more !!!!! Thanks Steve, people like you make sense to fishing. Spent the day with Steve today and had The Best Day Ever! What a patient knowledgable guy, and thorough instructor. He directed and coached me to the biggest and most fish I’ve ever caught! What I learned would have totally been worth it even if the fish weren’t willing, but it sure was cool they were. I fully intend to book another trip in the near future. Thanks Steve! I took Steve out for a 1/2 day trip. What a treat it was, trying to soak up the knowledge Steve has, learning lots of new techniques and general fishing stuff. Even in tough conditions, we got into some fish. Steve is very patient in his teaching, easy to spend time with and super knowledgeable. Take him out, you’ll have a blast and learn really cool wet fly techniques most anglers don’t use anymore. Along with a friend, I had a half day on the Farmington with Steve. He was a wonderful guide: very knowledgeable, patient, and fun to fish with. His attention to detail along with a very relaxed approach to fishing and guiding made for a great day. I had never wet fly fished in the way he showed us and will certainly try it on my own. Conditions were not great – very hot and low water – but we still got into fish. Steve’s statement that he is a teaching guide was very accurate. The emphasis of the day was on learning not scoring numbers. For me, that was the exactly right approach. Steve is an excellent instructor. I recently attended an on-the-water Wet Fly class lead by Steve where he managed to teach five of us – with varied levels of experience – the foundations of wet fly fishing, basic fly selections, and its application on the Farmington River. During the six hour course, he made a point to spend a generous amount of time working one on one with every angler to help meet the specific learning styles we needed to grasp and lock in the information thrown at us. Steve is extremely an knowledgeable fisherman and a fantastic resource, I’d highly recommend him for for someone looking to learn. Steve is an honest down to earth instructor with a wealth of knowledge and a great sense of humor. I participated in his wet fly class with four other anglers. He waked us through the way to set up the three fly rig offering tips and suggestions along the way. He made sure we were all set up before heading out on the Farmington. On the river, Steve discussed where to fish and how to fish by not just talking about it but demonstrating the techniques. During the six hour course he gave individual attention to everyone. Personally I learned a lot and it was information that was practical. I look forward to signing up for classes Steve will offer in the future. Had an awesome time with Steve on the Farmington in June. The half-day was hardly enough time to catch a few fish drop shot nymphing before spending the remainder of the day with wets. Poor casting, wet weather, chilly water and no bugs, Steve still put us on a bunch of fish. We barely scratched the surface of Steve’s vast knowledge of wets, such an incredible passion for his craft. I can’t wait to get back out there with him on a better day. I met Steve by chance in 2017 during a white fly hatch on the Housatonic, started following Currentseams, and finally spent a day fishing with him recently on the Farmington. In addition to being fine company, he is a firm but patient teacher with the deep knowledge and nimble adaptability to balance the science and art of angling. I am a slow-learner sub-middling fly fisherman, but the more I fish with Steve at my side — a gift to myself that I intend to keep giving — the more likely I am to up my game all the way to mediocrity. Along the way, I expect to net many more fish than I otherwise would have. Steve guided my son and me providing a very straightforward enjoyable approach to fly fishing. We don’t fish often so we needed some refresher tips and the information Steve provided was easy to understand and remember. His patience really stood out and we never felt rushed or uncomfortable in working with him. Every guide is different and Steve spent a fair amount of time discussing the different techniques before we got on the river, but once we started fishing we focused on the key ones. My son caught a beautiful fish on a day that appeared slow for other fishermen. We highly recommend Steve.